So I began sketching my thoughts on my mini-moleskine and quickly realized a pattern and paradigm familiar to my thinking. It was a pattern based on God’s mission in sending His Son to earth, especially His incarnation as “fleshed out” in John 1:14 (pardon the pun). Coupled with some practical reflections on what it means to “seek first the kingdom of God” (Matt. 6:33), I came away with this paradigm that focuses on (1) the priority of mission, (2) the centrality of the gospel, and (3) the normality of biblical community. Through these foci is the sweeping movement of the gospel story: the downward incarnational descent (deconstruction) and the upward transformational ascent (reconstruction). At the heart of this paradigm is a focus on how the gospel breaks into a fallen culture and transforms individuals, heals broken community, and impacts the world. I break down this verse in three parts: (1) the Word became flesh (2) and dwelt among us, and (3) we have seen His glory. The order is particularly instructive because it shows how God accomplished His mission. Ultimately, the goal is to see the glory of God in the face of Jesus Christ. This is the heart of the gospel and the only way people will ever be transformed. The gospel is all about the glory of Christ, and it is our preeminent goal that people see and behold Him in faith. This is also the main attack of the devil, to blind the minds of the unbelieving to keep them from seeing the light of the gospel of the glory of Christ (2 Cor. 4:4). So it makes sense that when we engage culture, we are entering enemy territory and desiring to see people “delivered from the domain of darkness and transferred into the kingdom of His beloved Son” (Col. 1:13). But God did not do this in a vacuum. Or with visions. Or with angelic messages in the sky. God clothed Himself in humanity and became flesh. He who “was in the form of God” (Phil 2:6) was “found in human form” (Phil. 2:8), being born in the likeness of man. Jesus was a real man, taking the fullness of what it means to be human. Because of this, He was relatable, contextual, and ordinary. Scripture says that Jesus “had no form or majesty that we should look at Him, and no beauty that we should desire Him” (Isa. 53:2). In the village of Nazareth, you could not separate Him from the crowd. He was a man among men. This is what it means that the Word became flesh. But He did not just become flesh, but He dwelt among us. He tabernacled among us. He entered our neighborhood and hung out. For 33 years. The first recorded miracle is mentioned by John almost by accident. Jesus was living in Cana and had a wedding invite, along with His mother, brothers, and disciples (John 2:12). It is fascinating that before the first miracle was performed, Jesus is entrenched deep in community. He traveled with an entourage to a party to celebrate the marriage of His friends. Jesus was not only relatable, but He was also incredibly relational. He brought the best wine and probably rolled with the biggest group. Two things happened: Jesus’ glory was manifested, and His disciples believed (spiritual). And that could not happen unless Jesus first took on flesh (physical) and dwelt among us (relational). People believed (spiritual) because Jesus dwelt among us (relational). Jesus dwelt among us because God gave His Son to us (physical)–and that by entering our world on mission to save His people from their sin (Matt. 1:21). 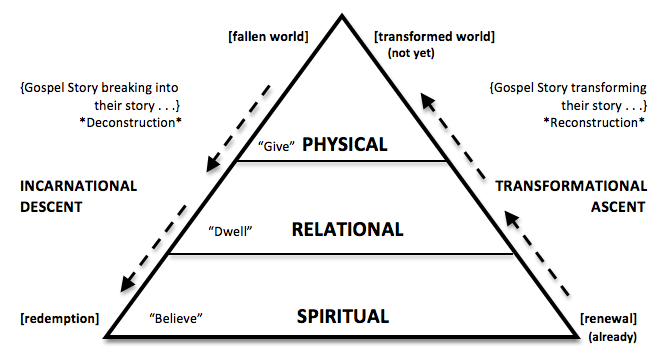 In my next post, I will explain more about the physical, relational, and spiritual as it relates to the triperspectival nuances of situational (kingly), existential (priestly), and normative (prophetic) and tie them into the John 1:14, the pursuit of God’s kingdom, and orientation of a life around the priority of mission, the centrality of the gospel, and normal live in biblical community.